A group of scientists led by Dr. Shinsuke Kawagucci at the Japan Agency for Marine-Earth Science and Technology (JAMSTEC: Asahiko Taira, President) have recorded the first full-depth profiles of hydrographic and geochemical properties in the Izu–Ogasawara Trench south of Japan. Using a conductivity-temperature-depth profiler with carousel multiple sampling system (CTD-CMS) installed on the research vessel Kaimei (Figure 1), the researchers observed a well-mixed hydrographic structure below 7,000 m depth, in the so-called hadal zone (the deepest region of the ocean). In addition, seawater samples collected from this layer exhibited constant concentrations of nitrate, phosphate, silicate, and nitrous oxide as well as constant nitrogen and oxygen isotopic compositions of nitrate and nitrous oxide. 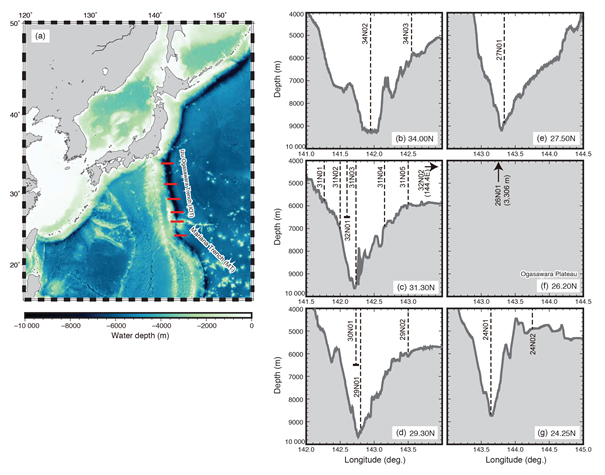 These results agree with previous observations of hadal waters in, and deep-sea water surrounding, the Izu–Ogasawara Trench. 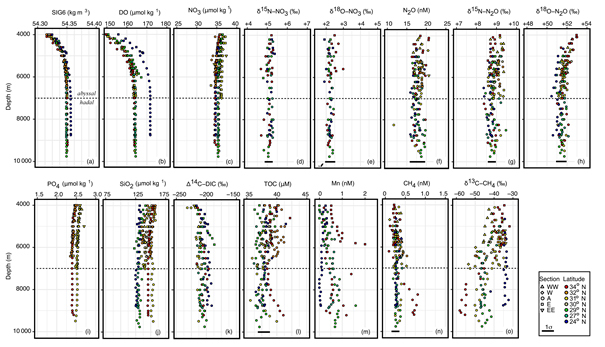 In addition, methane concentrations and isotopic compositions indicated spatial heterogeneity within the well-mixed hadal water mass. This strongly suggests a local methane source within the trench in addition to the background methane originating from the general deep-sea bottom water. Releases of sedimentary compounds associated with sediment re-suspension are a likely mechanism for generating this significant methane anomaly. The above study was published in Ocean Science on July 13, 2018 (JST). 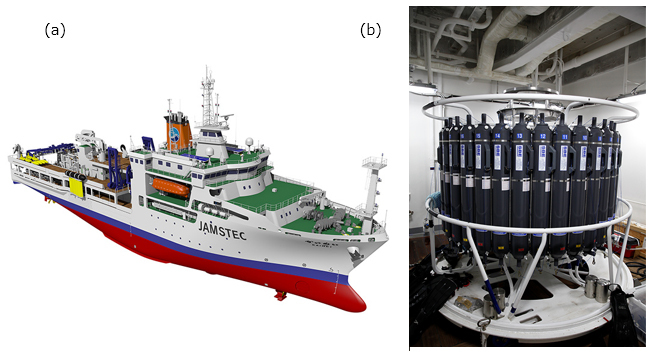 (http://www.jamstec.go.jp/e/about/equipment/ships/kaimei.html) and (b) CTD-CMS profiler. Figure 2. Seafloor topography of (a) the western North Pacific and (b–g) cross sections of the inner trench. Horizontal red lines in (a) represent the sections shown in (b–g). Vertical dashed lines in (b–g) represent CTD-CMS profile locations. Figure 3. Vertical profiles of measured parameters. Symbol shapes and colors are classified by location relative to the axis and latitude, respectively. Horizontal dashed lines indicate the abyssal–hadal zone boundary. Bold horizontal lines at panel bottoms represent 1σanalytical errors (not shown when errors are smaller than symbol size).